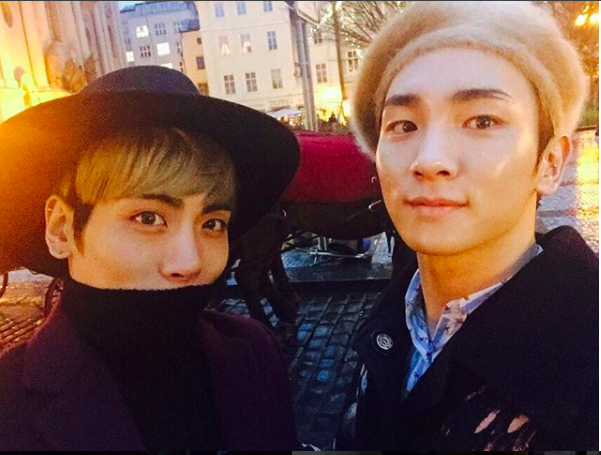 KEY COMPARTE UNA FOTO EN EL CUMPLEAÑOS DE JONGHYUN!!! EL DÍA DE AYER 8 DE ABRIL EL CANTANTE Y ACTOR KEY INTEGRANTE DE LA AGRUPACIÓN DE KPOP SHINEE, PUBLICÓ EN SU CUENTA DE INSTAGRAM UNA FOTO CON EL DESAPARECIDO CANTANTE JONGHYUN, QUIEN CUMPLIERA AYER 28 AÑOS. EL CANTANTE JONGHYUN FALLECIÓ EL PASADO 18 DE DICIEMBRE DEJANDO A LOS MIEMBROS DE LA AGRUPACIÓN INCONSOLABLES ANTE LA PÉRDIDA DE SU AMIGO Y COMPAÑERO DE TRABAJO. EN SU CUENTA DE INSTAGRAM KEY, DEJÓ EN MENSAJE "HYUNG, FELIZ CUMPLEAMOS, TE QUIERO, TE ECHO DE MENOS. ESPERAMOS QUE LOS CHICOS SE RECUPEREN DE ESTA PÉRDIDA Y POCO A POCO ENCUENTREN CONSUELO. MILES DE FANS ALREDEDOR DEL MUNDO CONMEMORARON EL CUMPLEAÑOS DEL CANTANTE, HACIÉNDOLO TENDENCIA MUNDIAL CON EL #HAPPYBIRTHDAYJONGHYUN EN TWITTER.